This weekend’s adventure took us to the holy city of Varanasi (also known as Benares and Kashi which means City of Life) in Uttar Pradesh. We decided on this trip last minute. 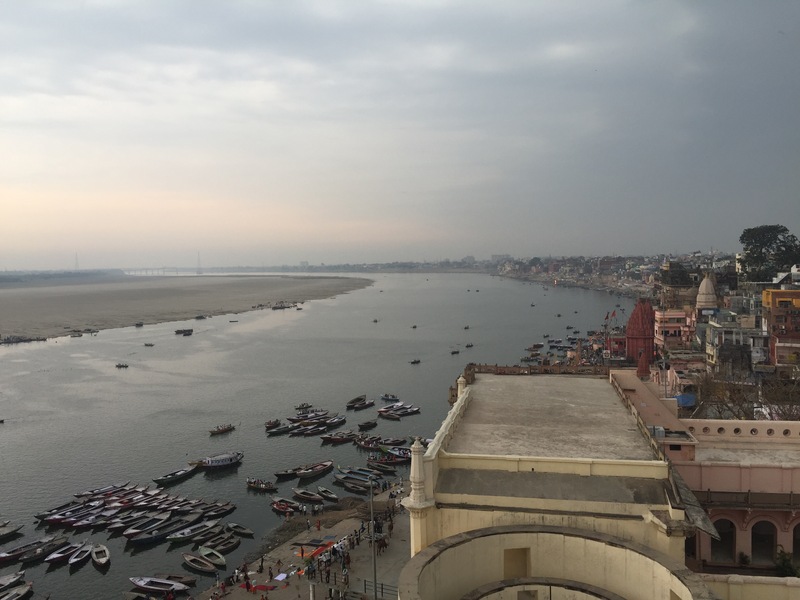 Our first week in Delhi we were chatting with other guests at the hotel and a few had mentioned Varanasi as a city worth seeing if we wanted to experience a different side of India. Varanasi is considered one of the holiest cities in India and is a place of pilgrimage for those in the Hindu faith. This remarkably old city is home to the Ganges, considered the river of salvation. It is considered auspicious to die here, since this city is said to offer an end to the cycle of reincarnation. The history here can be traced back to around 1400 BC. Deeply spiritual and overwhelming, this weekend was a fascinating glimpse into the Hindu faith. When we arrived late Friday night a taxi from our hotel (Rashmi Guesthouse – not five stars, but decent enough for the rooftop view) was waiting and we had about an hour drive into the city. Our hotel was located at the top of a hill overlooking the Ganges, making it impossible to get to by car. The hotel sent a guide down to walk us through the winding streets and back alleys up the path to our hotel. We never would have found it without help. They greeted us with flower necklaces and we went to bed fairly early after setting up a tour of the city for Saturday. Our guide, a Hindu man born and raised in Varanasi, gave us a tour of several Hindu temples in the morning. 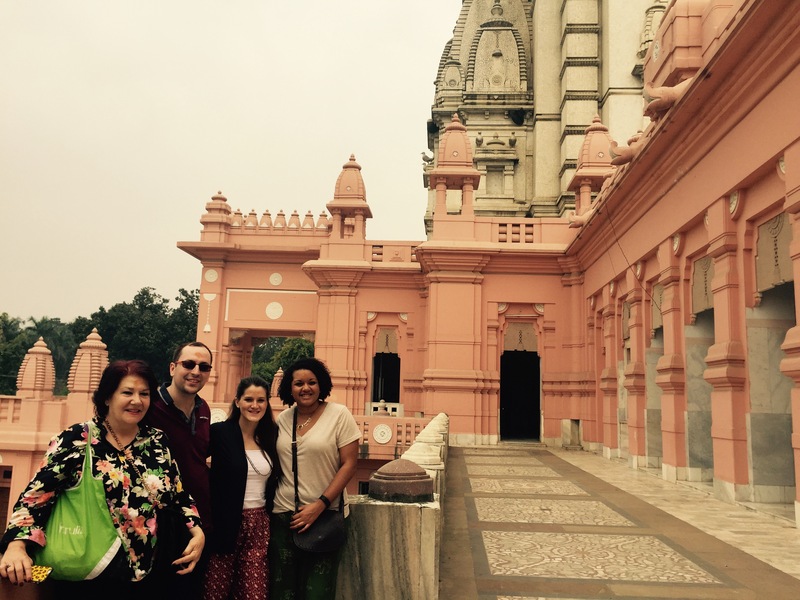 We started just after breakfast Saturday morning and visited the New Vishwanath Temple on the Benares Hindu University campus. We also picked up a new friend, Ann from New York, for the day. She was also staying at our hotel and wanted a day tour. From there we made our way to Sankat Mochan Hanuman temple. No photos were allowed here, but this temple was one of the sights that was attacked in a coordinated bombing that took place in Varanasi in 2006 killing 28 people. This is a temple built for the Hindu god Hanuman. 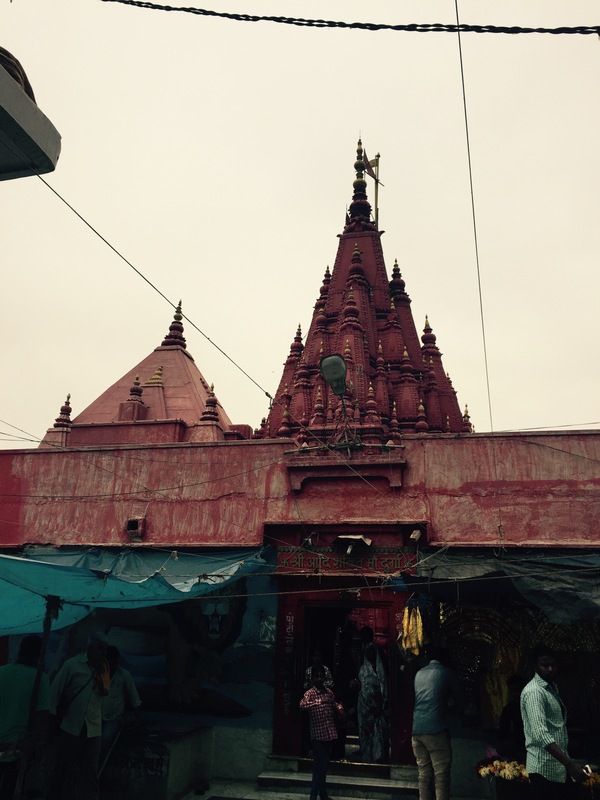 Our last Hindu temple was called the Durga Temple, which is also known as the Monkey Temple. It was built in the 18th century and was stained red using ochre. This temple was built for the Hindu goddess of strength and power, Durga. By mid-day the heat was getting to us and we were ready to see something a bit different. We made our way to this family owned silk shop. 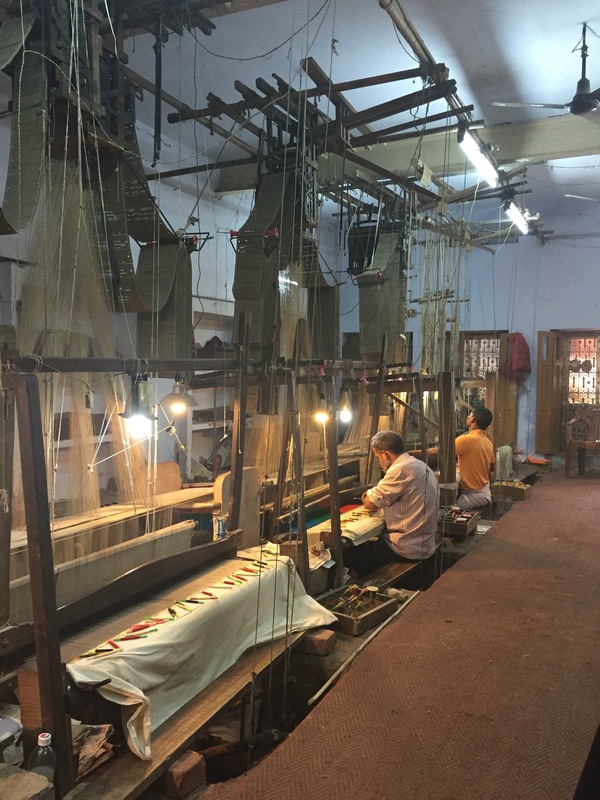 For six generations this family has been producing silk products in Varanasi. Learning a bit about the process and seeing the weavers was amazing. When in a silk shop, you but something silky, so I decided to add a wonderful deep purple silk scarf from Varanasi to my closet. In the afternoon, we made the 10km trip out to Sarnath to experience more of the Buddhist history that exists just outside Varanasi. It is said to be the place where Buddha gave his first sermon. This area has a lot of sights you can walk around and look at. It is much more peaceful than in Varanasi and has much more green space and a sense of calm. 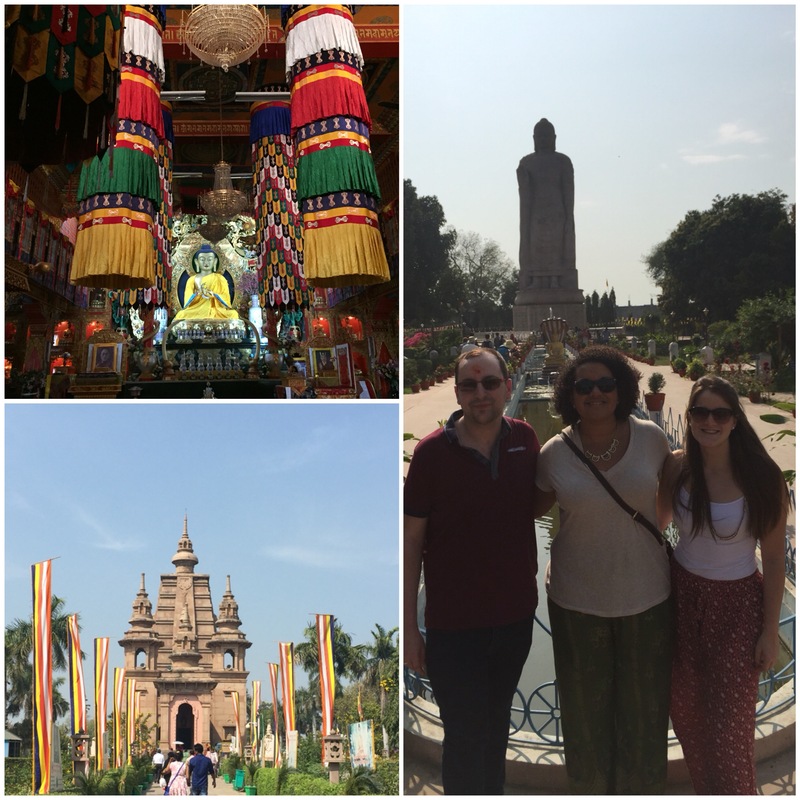 We took a look at the Mulagandhikuti, Archaeological Museum of Sarnath, Vajra Vidya Monastery, and ended with an up close look at the Statue of Standing Buddha which stands 80 feet tall. After a long day of temples and religious sites, we were all reaching the precipice of hangriness. For those that have not experienced this, it is the moment just before an emotional meltdown when you realize you are extremely hot, tired, and hungry, producing a form of angry dubbed hangry. 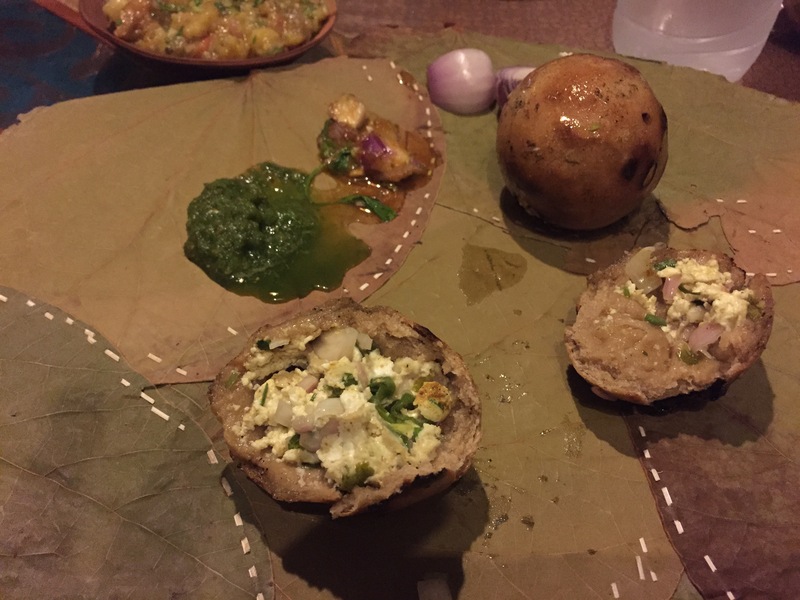 We weaved through traffic and landed at a wonderful restaurant called Baati Chokha where we enjoyed some local cuisine. It was fabulous! 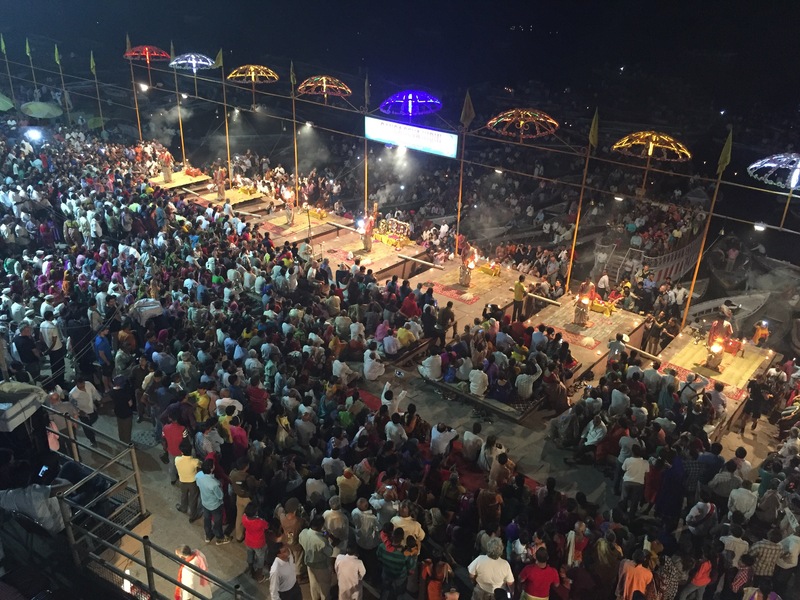 With full stomachs and the wrath of hangry Celete averted, we made our way back to the hotel to get in some rest before heading to the waterfront for Ganga Aarti – the evening ceremony that occurs each night on Dasaswamedh Ghat. This ceremony is a religious dedication to Lord Shiva, the river Ganges (considered a goddess in Hinduism), as well as the gods of fire, sun, and the universe. We collapsed into bed early Saturday night, I still wasn’t feeling 100% back to normal so I couldn’t wait to get some rest. The people who had tipped us off about visiting Varanasi said that the sunrise boat tour on the Ganges was a must-do, and I have to agree. We woke up around 5am Sunday morning and went down to the docks for a sunrise boat trip down the Ganges. We glided by the many ghats lining the shore; one for laundry, one where many Bollywood performances are filmed, a few for crematoriums (burning ghats), and all full of people looking to bathe their sins away in what is considered the holiest of water to Hindus. The main crematorium along the Ganges is a place where bodies are burned all day and night. Their ashes then released into the river. 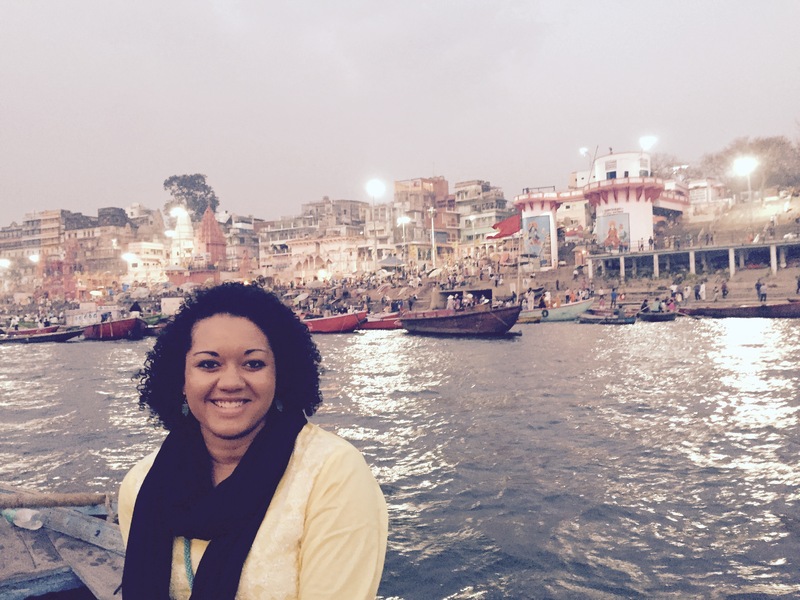 Varanasi is unlike any city I have ever experienced, and I can’t imagine any place like it existing in the world. As interesting as this weekend was, Varanasi was the most emotionally difficult city I have ever been to. The entire weekend left me feeling burdened and with a sense of what I think I would call ‘dark’ energy. This is probably mainly because my Christian faith is so vastly different than the Hindu religion. The constant, unwavering dedication and offerings to icons and various gods seems so disconnected from the freedom and grace I have come to associate with spirituality. Varanasi was challenging, heartbreaking, beautiful, informative, and every bit worth visiting. Though once in a lifetime was enough for me.